The cross is lying on the ground, not standing up vertically. The materials of which the cross is made are unusual as well: a steel frame filled with earth. Even so it conveys a Christian message to me. The cross is not empty to me, not robbed of its meaning by its surprising materials or an absent body of Christ. The steel frame tells me that the cross proclaims an enduring and unchanging message. It is, however, not the form of the cross that is most important here, but its content. Yet the frame of the cross keeps this content together and makes sure that we do not forget that Jesus died for us as a reconciliation for our sins. On the one hand the earth reminds me of our human transitoriness and how this is expressed on Ash Wednesday in the sign of the cross of ashes on the forehead of the believer and the words of Genesis 3:19: ‘You are dust, and to dust you shall return.’ That’s why to me the earth symbolizes the body of Christ, also in the sense that all believers together form the resurrected body of Christ. Does the earth not consist of countless particles of dust? On the other hand I see in it the potential fertility of the earth. Now it still looks dead and lifeless, but a little water is enough to waken hidden seeds to life and make them bud from mud. In this cross the resurrection is present in the receptivity of the earth. In the same way a small external impulse or nudge by the Holy Spirit can awaken hidden seeds in us and make us alive and fruitful. 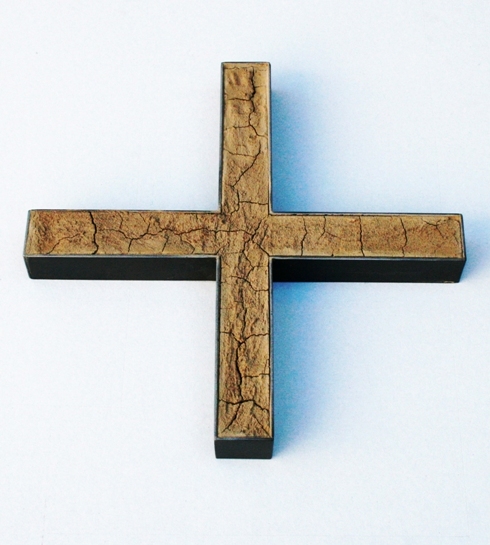 Madeleine Dietz: Cross, 2003, steel and dry earth, 45 x 45 cm, © Madeleine Dietz. Madeleine Dietz (b. 1953) is a German artist. She studied at the Werkkunstschule Mannheim. She makes installations and video installations. She has completed various large projects for churches and cemeteries. See www.madeleinedietz.de. Patrik Scherrer is the driving force behind the German website Bildimpuls. Every fortnight he sends out a ‘Bildimpuls’ or visual meditation, in which he focuses on contemporary Christian and religious art from Germany, Switzerland and Austria. He studied theology and works with the mentally handicapped. He wrote the book Gott in Sicht? 33 Impulse zum christlichen Glauben aus der Pinakothek der Moderne, Schnell & Steiner, 2005. On the Bildimpuls website there is also a lot of information about artists, books, museums, exhibitions and organizations. See www.bildimpuls.de.